Posted on July 3, 2017 at 11:33 am. 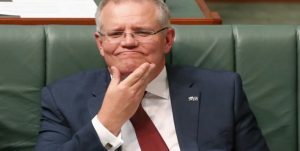 Treasurer Scott Morrison has said while he has “great sympathy” for the way gambling revenue is distributed in Western Australia, pokies revenue will not be added to the national GST carve up. The news comes as a great disappointment to Western Australian MP’s who have been lobbying for national pokies revenue to be distributed throughout all states, in the same way that WA’s mining revenue is used. Western Australia is the only state in the country which does not allow electronic gaming machines to operate in its clubs and pubs, restricting pokies to the state casino, Crown Perth. This means the state earns a relatively small amount of gambling revenue in comparison to major pokies states like Victoria, New South Wales and Queensland. If pokies revenue was added to the GST carve up, the move would cost Victoria and New South Wales hundreds of millions of dollars annually, but would provide a great boost to WA’s struggling deficit budget, which is expected to reach $3 billion this year. Earlier this year, West Australian Premier Mark McGowan said that adding pokies revenue to the annual GST carve up would not only benefit WA, but would also provide a deterrent for the other states who rely heavily on pokies to boost their economy. The Productivity Commission review into how GST distribution could be affecting economic growth is currently underway. The McGowan government has submitted a request the Commonwealth Grants Commission to reassess the way gambling taxes are generated. Scott Morrison slammed the request to a Perth business group on Saturday, saying the current system is fair. “The CGC assesses every state’s capacity to raise revenue, not the actual revenue they raise, because the method is policy neutral,” he said. “This ensures that one state’s policies and choices can’t be used to game the system and maximise the level of GST it receives.